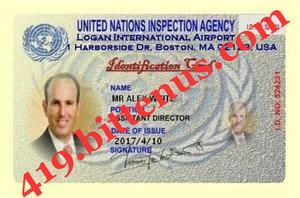 My name is Mr.Alex White,i am the Director Inspection Unit, United Nations Inspection Agent. We are currently in Boston Logan International Airport,Boston, United States for official inspection while i discovered an abandoned shipment from UK via Diplomatic cash package with your name/email tagged on it,when i personally scanned it, it revealed an undisclosed sum of money in three Metallic Trunk Boxes weighing approximately 35kg each. On my assumption,each of the 3 boxes will contain more than $5M or above in each. On further investigation, i discovered that the consignment was abandoned due to wrong declaration of the content, also the Diplomatic agent inability to pay for Non Inspection Fees, because he did not know the content of the boxes. I will arrange for the boxes to be moved out of this Airport to your address once we put heads together and pay for the Non Inspection Clearance Charges, once we are through I will personally bring the funds to your doorstep. Now i want to strike a deal with you, in your acceptance to assist me pay for the Non inspection charges i will proceed on this. I have the capacity to secure the release of your consignment with my status as a United Nations\\Inspection Agent. You will give me 10% of the amount in the consignment and you take the remaining 90% when we cleared the consignment. I am asking for 10% because i want to assist you to pay for the non inspection charges but if if you feel it is too much for you, you can give me anything you want from your heart. If you are not in agreement with this proposal, please disregard it.But if you can meet with my condition, then we have a deal. I can get everything concluded within 24 to 48 hours and proceed to your address for delivery upon your acceptance. Write me on this email: mralexwhite20017@gmail.com if you accepts to work with me.Send me your cell phone number and your address and your full name. You can as well call me on this number (+1) 617-475-0973 if you wish to speak with me but if you call and could not reach me on phone note that i am on the field for inspection, So leave your information so that i can reach you when i am back in the office. The consignment was abandoned by the assigned carrier diplomat from London U.K,because the Contents was not properly declared as "MONEY" rather it was declared as personal effect to avoid interrogation and also the inability of the diplomat to pay for the INTERNATIONAL CONSIGNMENT MONEY MOVEMENT Charges of US$19,850.00 to the U.S government before bringing in the consignment into US, we refused to return back the consignment where it came from since, we have already received it. On an official inspection conducted by our security units, we discovered that each of the box contain $5.5Million and the consignment is still left in our Storage House here at the O'Hare International Airport Chicago USA till date. The details of the consignment including your email address from country of origin were tagged on the Metal Trunk boxes in your favor,proofing that your the legitimate and rightful owner of the two trunk boxes. You have been giving a last minutes opportunity to get an Irrevocable International Diplomatic Cash Delivery Waiver from World Bank office in Nigerian ,been the country of origin of your fund through the office of Mrs. Rosemary Williams, Email: rosemarywilliams@rocketmail.com Tel: 234-81-56865903 . A duly endorsed and certified Irrevocable international diplomatic cash delivery waiver from World Bank office in Nigeria in your favor will give us the legal right to proceed to your choosen located address for the delivery of the said two trunk boxes to you as the legitimate owner without further delay or any form of payment for whatsoever reason . I wish the best of luck, God blessing, as i look forward for your prompt and positive responds, because we have a limited time frame to complete everything about your delivery and submit our report to US congress and United Nations security Council as directed, so help us to serve you better. I received your mail though this is not my first time of contacting you over your abandoned consignment here at the airport, however your funds is still waiting for delivery to your address if you are ready to work with me at this time before the Airport Authorities confiscate your consignments. However i am very sorry for my late reply , we have been very busy at the airport inspection field all these while. Meanwhile am writing to acknowledged the fact that i have received your mail as we have been very busy at the airport all these while due to influx of cargo goods and inspection that is going on at the airport presently. Also this funds belong to you and i will deliver your funds to any address you provided to me hence all legal process are duly finalized. At the same time i want you to know that am ready and willing to work with you and you will receive your trunks and begin a new life as i know there is noting that will stop me from bringing your consignment to you if only you will stop the issue of who will pay the fee or not because you should have known that i work with my colleagues and the airport senior officers here and there is no way we can get your consignment out of here without following the legal and due process here. Secondly on the issue of the covering documents backing your funds, i want you to know that all the legal documents backing your funds are here and your funds will be delivering to you alongside with all the legal documents backing your fund and there is noting to worry about as you are not the first person that i have delivered his funds to. As i also said before and as a UN inspection expert, no authority will question me at the port of entry into your airport as i know the law and as a law abiding citizen, i will make sure that every document is intact as i do not need any delay at the airport due to the nature of my job as i need to deliver your fund to you and return back to my work. I also want you to put myself in your shoes and know that there is no way the authorities here who have inspected your consignment and known why the diplomat abandoned your consignment will allow me to take your consignment to you without you paying part of the fee which they will confirm from the receipt of the payment you made, there is no need of over arguing this issues here or pretending that you do not know the truth because if it is possible as you may think, most of the corrupt officers here would have offset the fee and receive these consignment long before our arrival here but because the trunks are been tagged with the receivers address and other valid information, there is no way they can do it. There is no way i will advise you to pay the whole fee because i want to be part of this deal and there is no way you can receive these trunks without paying the Non-Inspection fee because your receiving information and the trunks tagged number is already in the system here, So i will personally advised you for the last time to have a second thought because what you should be looking at now is how to get your trunks and not who will pay the non inspection fee as you may know that i am only striking a deal with you and neither am i persuading you or forcing you to receive what legally belong to you. If you are not ready to receive your consignment now that we are here i doubt when you will receive your fund, what i will promise you is that i will never fail to bring your fund as agreed as soon as we pay the non-inspection fee of $850 as i will personally bring it to your doorstep with my immunity coverage as a UN inspection expert. This Non-inspection charges of $850 is the only fee we have to pay and i will bring your consignment to your doorstep, So i will like us to share this fee into two where you pay half and i will pay half of the fee so that they will know you are aware that your consignment will leaving to your address. At this juncture i will like you to tell me how and when we are going to pay the non-inspection fee of USD$850 (You Pay half and i pay half) and when you will be sending your own part so that i can notify airport authorities here as only me cannot pay the complete fee, there is no time to delay any more as we will be leaving here by Wednesday next week as we have another inspection assignment in Montreal Canada next week, So the early you understand this, the better for you. After going through this letter, kindly reconfirm the following to us to avoid delivering to a wrong person. Meanwhile attached document here is the photographic view of your consignments during our routine check at the airport storage facility,my working identification etc, So download them carefully for your perusal and get back to me on your readiness to receive your fund or not.